RFC series machine is a fully automatic multi functional combined machine integrating washing, filling and capping into single body. This machine is equipped with advanced man-machine interfacial control technology with all necessary automations. It works on hanging neck holding method. Hence, very convenient bottle changeover. Versatile machine to pack mineral water as well as other beverages like fruit juice, square etc. which are filled at higher temperature by changing some parts. The in-feed star wheel has spring loaded neck gripper fingers, which compensates for minor variation in bottle-neck diameter. 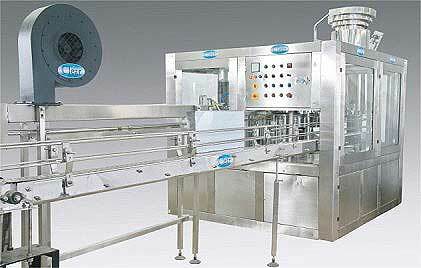 The bottles fed by air conveyor are picked by fixed size neck star neck and transferred between grip fingers. This eliminates the need of feed worm and change parts for different sizes of bottle body diameter. The neck spider transfers the bottles on to rinsing turret, which has neck gripping fingers to carry the bottle around rinsing. The spray nozzles have No Bottle – No Rinsing spray mechanism, which saves water. The rinsing takes place during 90 degree rotation of turret. Thereafter for next 90 degrees bottles are tilted back by small angle to give adequate draining time. Fill Volume 200 to 2000 ml.